What makes a good rib? It starts with slow-and-low cooking over hardwood for just the right amount of time. That’s what gives the meat a hint, but not a wallop, of sultry smoke—the thin, pink smoke ring just below the crust of spices is your proof. The next test: A gentle tug should be all it takes to pull the meat from the bone. And finally, it should taste so good you can’t stop thinking about it. 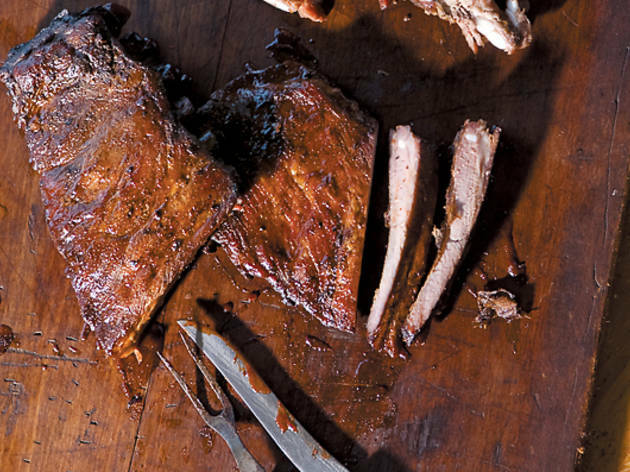 For daydream-worthy ribs, try these guys. Uncle John’s We used to be in love with the hot links, then the tips, next the slab bacon and, recently, the fried chicken. Currently, the ribs have us swooning: firm but well-marbled meat and plenty of it, a solid smoke ring throughout the slab, and minimal seasoning with a tiny kick. 337 E 69th St (773-892-1233; half slab $9, full $14). Smokin’ M’s You wouldn’t expect much from a strip-mall storefront, but this overlooked joint nails Southern staples (including down-home friendliness). 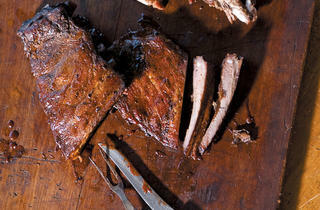 The caramelized spice rub on the slabs of meaty St. Louis cuts (spareribs sans tips) gives them a slightly chewy crust. Underneath lurks a quarter-thin layer of smoke over a full inch of robust pork, and it takes just the right amount of effort to separate the meat from the bone. 7501 Roosevelt Rd, Forest Park (708-488-0123; half slab $11, full $18). Big Ed’s You might expect a pit master like Big Ed to put up ribs that slam you with fat and smoke. After all, many of Ed’s customers are Chicago Bears, who practice nearby, and football players aren’t known for being nuanced. But while these ribs don’t skimp on the meat, overly fatty they’re not. And the smokiness comes second to the porkiness. Think of these ribs as tackling you with flavor—just, you know, gently. 2501 Martin Luther King Jr Dr, North Chicago (847-578-1901, bigedsllc.com; half slab $12, full $20). Smoque The baby back and St. Louis ribs get a flavorful Memphis-style dry rub (we tasted paprika, garlic salt and plenty of black pepper) and slow smoke over both apple and oak wood. Delicate diners, go with the baby backs; cut closer to the backbone just under the loin, these deliver lean, but incredibly tender, meat. Ravenous carnivores, go with the St. Louis, the meatier of the two. No one will be disappointed. 3800 N Pulaski Rd (773-545-7427, smoquebbq.com; half slab $10–$11, full $17–$18). Smokey’s BBQ How can a place execute solid ribs but bobble pulled pork and brisket? Let’s chalk it up to specialization. Menu options such as “Uncle Kenny’s Famous Mediterranean” might lure you, but original is the way to go. The caramelized spices get a glaze late in the game, moistening the exterior into a flavorful, slightly chewy crust. These meaty ribs stand up to the smoke well for good balance in every bite. 5481 N Northwest Hwy (773-763-2328, smokeysbbqchicago.com; half slab $11, full $19).